So, it has come to this. One match to rule them all... or, something. Dramatic phrases aside, there is a lot riding on this one match. Well, one thing in particular: Champions League qualification. After a scoreless draw in Istanbul, Arsenal and Besiktas will square off in London in a winner qualifies battle (Besiktas would also qualify on away goals with a score draw, of course.) So yes, Arsenal need a win at the Emirates tonight. Leave it to Arsenal to make things as dramatic as possible. Every season feels like a story being told by a lunatic novelist. After about 75 minutes on Saturday (or, at least before the comeback was on,) I talked about how narratives require the hero to face adversity near the beginning, otherwise the viewer might not be hooked. "For example, that movie where we won the FA Cup last year started with that ridiculous loss to Aston Villa," I said. The point is, it wouldn't be interesting if your protagonist had all the money in the world to spend on players and opened the season coasting past two sides that played in the second division last year. Who would read that? Nights like this are what sports fandom is all about. Dizzying tension. Gut-wrenching twists of the plot. High anxiety. Colossal stakes. "The thrill of victory and the agony of defeat," as the old Wide World of Sports intro said. These matches build character, make you feel alive. May as well enjoy the ride. All right, let's just start with who's not playing. 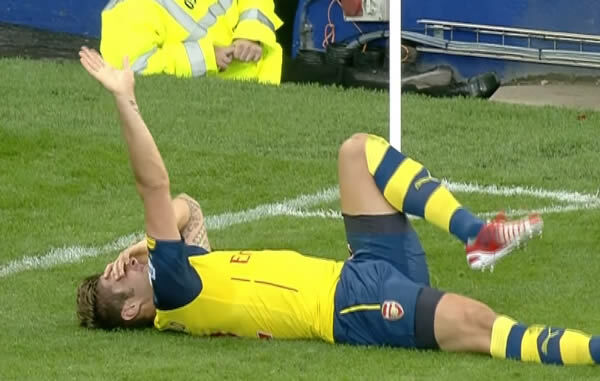 Massively unlucky news for Olivier Giroud, whose innocuous blocked clearance late in Saturday's 2-2 draw has resulted in a suspected broken foot which could keep the Handsome French Bloke out until the New Year; better this happen six days before the close of the transfer window than one day after. The news means Arsenal are now unlikely to sell Lukas Podolski, as the Gunners are now desperate for any sort of scoring touch. Up top, Yaya Sanogo trained with the team but was not in the 18-man squad against Everton at the weekend; he's still recovering from a hamstring tweak after starting the first match of the season against Crystal Palace. I'll venture a guess and say that Alexis Sanchez gets another crack at the center forward spot. Arsenal will be buoyed by the first appearance of the defense pairing of Per Mertesacker and Laurent Koscielny of the season; Mesut Ozil will hopefully provide the creative spark Arsenal need to nick a few goals. I'm predicting Santi Cazorla and Alex Oxlade-Chamberlain to start wide, though Lukas Podolski and/or Joel Campbell could be surprise inclusions. Predicted XI: Szczesny, Debuchy, Koscielny, Mertesacker, Monreal, Flamini, Wilshere, Ozil, Cazorla, Oxlade-Chamberlain, Alexis. Demba Ba remains a dangerous target man. No changes for Beskitas from last week, in terms of player availability. Canadian Atiba Hutchinson remains a doubt, but a week of rest means he could be back in contention. With no reason to make any changes, I would not be surprised if Beskitas played the same XI as they started last week, which includes former Arsenal youngster Oguzhan Ozyakup. It should be noted, however, that that XI was a more cautious 4-2-3-1 than the manager's usually preferred 4-4-2. Speaking of that manager, Slaven Bilic will be serving a one match touchline ban after being sent to the stands at the tail end of last week's 0-0 draw. Predicted XI: Zengin, Koybasi, Franco, Gulum, Ramon Motta, Uysal, Kavlak, Sahan, Ozyakup, Pektemek, Ba. home against a non-German side. That's Park on the left. Nothing has changed for Besiktas in terms of their form; the Turkish Super Lig does not start until this weekend, when Besiktas will face Mersin Idmanyurdu, a side who yo-yo'ed back to the top flight after a year in the TFF First League, the Turkish second division. Arsenal's streak of 12 consecutive Champions League play-off victories came to an end with last week's draw in Istanbul, though that means the club still has gone 13 unbeaten in such matches. Moreover, as the scene switches to London, it is of note that Arsenal have never conceded a goal at home to Turkish opposition. This will be Besiktas's second visit to London in the club's history; they emerged victorious from their first, 2-0 over Chelsea at Stamford Bridge in 2003. Besiktas are also unbeaten in their last three away matches in the Champions League, a run which includes a 1-0 win at Old Trafford in 2009. "No, I didn't see the elbow. This is for your hair." The match officials are from Portugal; the referee is Pedro Proenca. You'll most recently remember Proenca as the referee from the World Cup Round of 16 match between the Netherlands and Mexico, when he controversially awarded Holland an injury time penalty kick after a theatrical tumble from Arjen Robben. 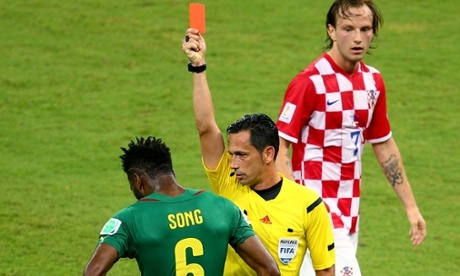 He's also the referee who sent off Alex Song for his absurd elbow-in-the-back. Proenca has never worked an Arsenal match in his career. English sides have an all-time record of five wins and two draws, with no losses, in Champions League play with Proenca in the middle. One of those five wins I guess could technically be counted as a draw; it was Chelsea's 2012 penalty shootout Final victory over Bayern Munich. Zenit St. Petersburg wins 4-0 on aggregate. Maribor wins 2-1 on aggregate. APOEL wins 5-1 on aggregate. BATE Borisov wins 4-1 on aggregate. Porto wins 3-0 on aggregate. Red Bull Salzburg leads 2-1.